The 11+ Felt iPad Case is a cleverly designed accessory that is crafted from felt for a soft tactile experience. The case opens to reveal a sleeve for laptops or tablets, as well as storage compartments for headphones, cables, and other small pieces. The felt case is available in two sizes—a smaller version that holds an iPad Mini, and a larger version that holds a regularly sized iPad, iPad Air, 12” Macbook Air, or a Galaxy Tablet. When opened, the larger felt case presents a soft surface for a MacBook to be placed, and the interior surface can be used as a mousepad. The smaller felt case can be folded to prop up the iPad Mini, making it a convenient stand when traveling on an airplane. 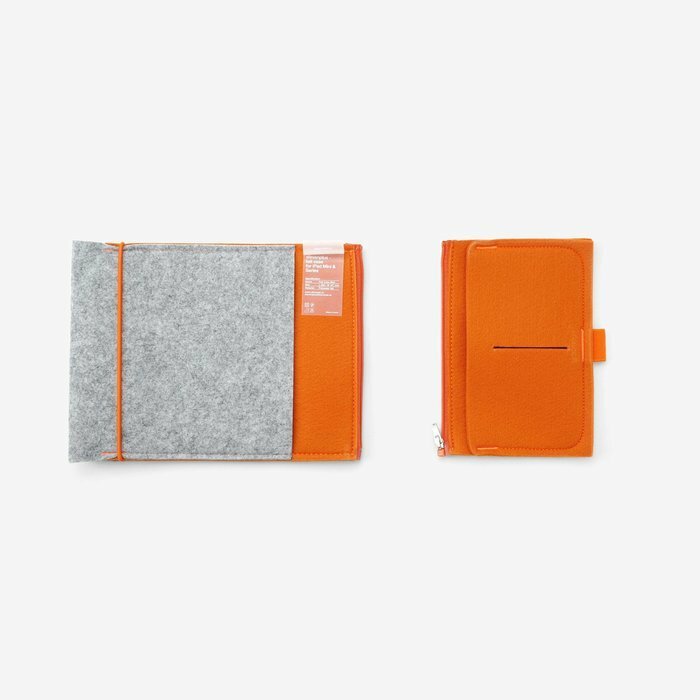 Each felt case is handmade, and closes with a contrasting orange elastic band.